Musculoskeletal disorders are multifactorial, that is, they are often associated with more than one causal factor. Numerous observation schemes, check lists, numerical methods, and instrmental methods have been proposed for observing and characterizing risk of work related musculoskeletal disorders of the upper limb. Often it is the case that these systems are more sensitive to one factor than anther and consequently will be found to work better in one situation than another, which probably explains why each investigator has his or her favorite system. It is important that users understand the factors that are present in each situation before conducting a detailed analysis. Often these factors can be assessed through evaluation of work factors such as production standards and tool and equipment attributes. They also may be assessed through observation of the job. The purpose of this page is to provide a systemmatic method that can be used to assess presence and magnitude of the most commonly cited work related factors. We have found this to be useful starting point that provides insight into the possible causes of problem situation and helps the investigator determine how to procede with possible interventions or additional analyses. the analysis include a thorough documentation of what the worker uder study does. video tapes of selected jobs be saved as bench marks for each attribute. The jobs periodically be rated by a team of 2 to 5 people so that they can discuss and agree on the important factors affecting each factor. The following scales are provided to help investigators with this work. Reference: Latko, W., Armstrong, T., Foulke, J., Herrin, G., Rabourn, R., Ulin, S. Development andevaluation of an observational method for assessing repetition in hand tasks. Am. Ind. Hyg. Assoc. J. 58(4):278-285, 1997. Repetition is an index of the frequency of movement or exertions, the speed of the motion, and the recovery time. At one extreme the hands are idle with almost continuous recovery time. At the other extreme the hands are moving a rapidly as imaginable with no recovery time. Force is an index of the effort exterted get, hold, or use a work object or to support the weight of the body. Both averate and peak forces should be assessed. 15% is considered the maximum force that can be exerted for a prolonged period of time without exhaustion. Higher forces may be exerted for shorter periods of time. Both average and peak forces should be rated. Force can be assess from observations of the worker and from consideration of task factors. Contact stress: Contact stress is the force per unit area acting between the body and an external object. While it can be expressed as pounds per square inch or Newtons per square meter, so it is necessary to assess the force and the area of contact. Here contact stresses is rated from nothing to the greatest imaginable. Nothing correspondes to the situation in which there is not contact with the body. The greatest imaginable corresponds to the maximum that could be tolerated for a very short period. Both averaage and peak stresses should be rated. Skin temperatures less than 70 deg F adversly affected sensitivity and dexterity. Skin temperature is related to the air temperature, the temperature and conductivity of work objects, and clothing. 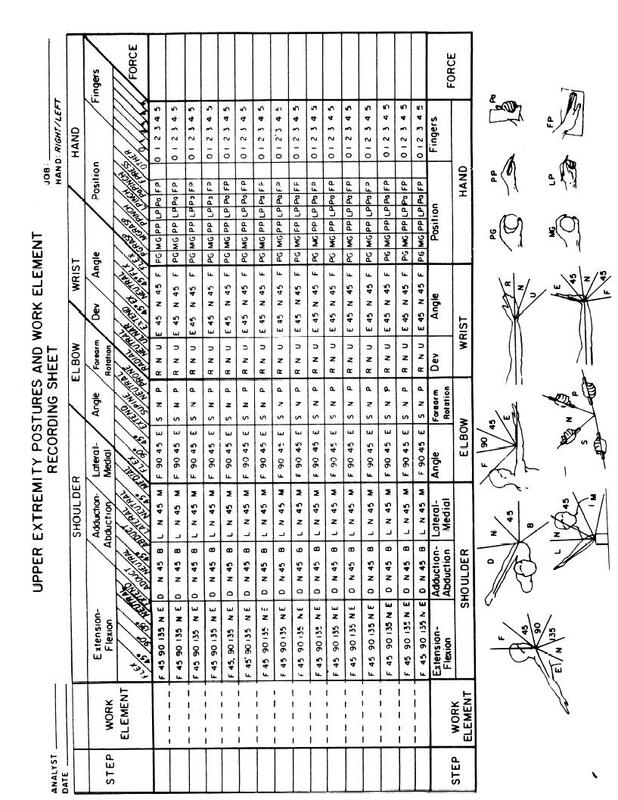 Summary guide for rating physical stresses Adated from: Latko, Wendy Quantification of Work Factors of Upper Limb Disorders, Ph.D. Dissertation in the Department of Industrial and Operations Engineering, University of Michigan, Ann Arbor, MI, 1997. Form for recoring upper limb postures at specific times or events. From: Armstrong T, Foulke J, Joseph B, Goldstein S. Investigation of cumulative trauma disorders in a poultry processing plant. Am Ind Hyg Assoc J 43(2):103-16, 1982.